It's exhausting, and not just for me, but my poor mother in law is working and working on this. And the worst part is, its mostly my fault (and a little bit the 8 cats fault, for shedding fur, mostly long haired, which makes the dust here delicious). Or the piles of sheets and re-purposed clothes, all awaiting their transformation into medieval-inspired gowns and nostalgic children's clothes. For some reason they really like fabric stored under beds, and in closets. I don't know why they are on the cotton as they can't eat cellulose, but I suppose a thin layer of cat hair is all they need. 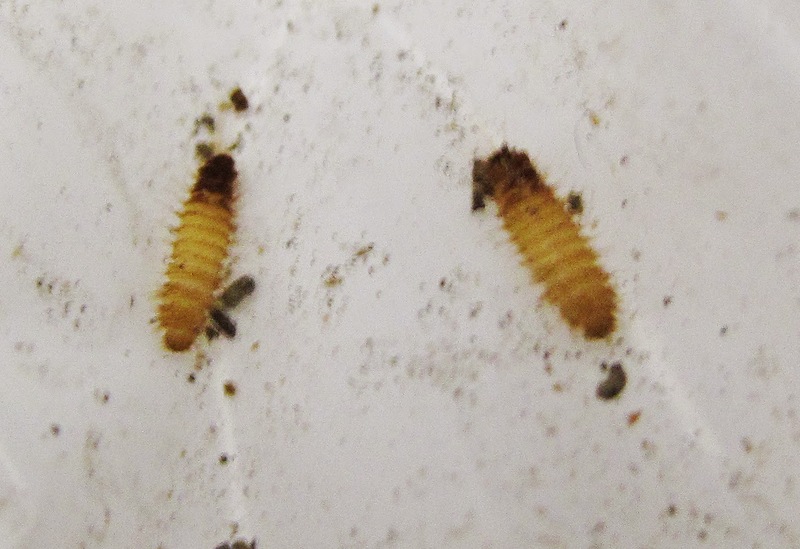 And evidently the leather & keratin-muncing pupae (hatch in 5-35 days, are pupae 2 months to 2 years) live quite a while, eating and eating in the dark to prepare for their brief 2 weeks of adult life in the light. When I found the first signs, and told Josh, he said "Store up not for thyself..."
When I threw the wine-colored coats in the trash, and said it to myself. I think God is trying to get my attention. 1. Vacuum the floor and closets 2x a week. (and wipe down dusty baseboards) Mondays and Thursdays. Make one of those times moving furniture that can be moved. 2. Do a deep cleaning 2x a month. (moving mattresses, vacuuming under beds, dusting bookshelf tops and trying to vacuum as much as I can behind dressers, dusting baseboards) First and Third Mondays of a month. 3. Do Fall and Spring Cleaning, moving all the furniture, shampooing the carpet (especially closets) and washing the walls and baseboards. 4. Don't store stuff under beds, or on carpet level. Put it in tubs and stack them to high heaven. 5. If I'm not planning to make it into something in the next 7 years, DO NOT BUY IT, nomatter what a great deal it is. While I might be saving money on a deal by buying it now, say I get it for 4 bucks now instead of 24 bucks ten years down the road, I am saving 20 bucks but hauling a chunk of stuff around with me FOR 10 YEARS. That's 10 YEARS of space used up in my home, 10 YEARS of mental stress about my stuff not getting moth and rust and all that. It comes out to 2 BUCKS A YEAR for hauling it around. So if I realistically am not sewing something for the next 7 years, don't buy it. I hate to think of a 10" x8" piece of a white sheet rotting in a landfill just because I was too lazy to come up with a use for it. I hate wasting fabric, even cheap fabric. To the point that I find cutting out patterns mentally exhausting, as I reposition my pattern pieces for half an hour, trying to get the least wasteful method of cutting them out from a polyester mockup sheet. I want to have a scrap bin, waste turned into endless possibilities, that I will transform into amazing things. But the truth is, my scrap bin is paralyzing. I feel I must justify the existence of each scrap, like the animate things in a Hans Christian Anderson story, and give them purpose. And if I throw them away, its like I've failed. It's emotionally exhausting to dig through the scraps and try to think of uses for little odd shaped trapezoids of fabric. I cart around little 2" wedges of fleece that I might turn into fleece flowers, etc, because I can't bear to see them sitting in a landfill till Jesus comes back. But all I'm doing is turning my house into that landfill. And it is paralyzing my creativity (Its so much easier to make flowers from a 75 cent piece of felt, than spend an hour piecing together fleece bits from my scrap bin), and time is a resource too. A very precious limited resource with the kids and all. And something else I've realized. Trying to make cool stuff when you are unemployed or trying to support 3 kids off a grad school stipend, made me value money. If I could decorate, sew, and make beauty for cheaper, than it was possible. I wanted to prove that you didn't need money to make things. That you could get a medieval gown with thrifted table-clothes, a medieval hauberk with a stained leather jacket at a thrift store. That with grit and ingenuity, I could make all those things that other people spent thousands on, with grit and pocket change. But there's something else, much much more precious and limited than money. Time. I only have one life on this earth. But I only have one life on this earth. And while I could do it, it would use up all my time. "Fix your eyes on Jesus, the Author and Perfector of our Faith....so that you may run..."
Jenny is really into building things. It started ages ago, one morning (perhaps she was a year and a half?) I went into their room in the morning, to find Isaiah asleep, and Jenny had quietly built a tower, which she was then observing, sucking her thumb. As I came into the room, she pulled out her thumb and told me "I buiwd a castwew [castle]"
For her birthday we got her more megablocks. She has this dedicated intense mode when she builds. Like she's a little engineer, stratregizing, creating. Isaiah gets very emotionally involved in his creations. Whether they are supposed to be "lambs" or "Big Green Hulk" or just a tower. When they fall down, he freaks out. The tower partially collapsed. Isaiah wept. Jenny observed, and built more things. I put on the old Gondor Tunic (just a Tunic cut from a black worn out adult's T shirt, that I embroidered with a bit of white DMC floss from Walmart) that I had made for Isaiah for Hallelujah night 2011, onto Jenny, and without the belt and pants, it made a little dress. It was before I knew about knit neck bindings, and alas, I cut too large to fit over Isaiah's huge little head. 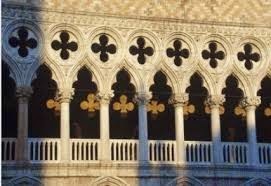 Best view of the embroidery. Alas, she is coveting Isaiah's "cohwd bag"
They had a little struggle over the "cohwd bag" (cold bag) which Isaiah had for a bump on his head. Jenny is upset, while I try to explain to her that Isaiah needs it because he got hurt, and Jenny doesn't really need it. Jenny triumphs in her victory. Anyway, here Jenny has proudly announces she's drawn some "stoymtoopehs"
I took them inside, and posed Jenny on a chair to photograph her tunic. That's her "I know I'm cute" face. Isaiah kept the baby occupied. Often I come up and hear Keziah laughing, and Isaiah playing with her and being silly. Here are what selfies look like when you've got 3 kids. I must make this. applique trees and leaves etc (w/ heat n bond, I have no shame. 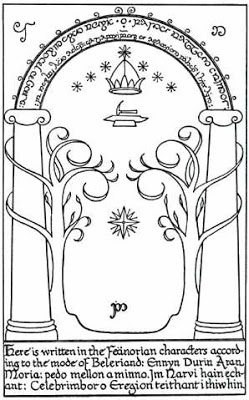 The elves probably had cool stuff) maybe outlined in silver stem stitch? 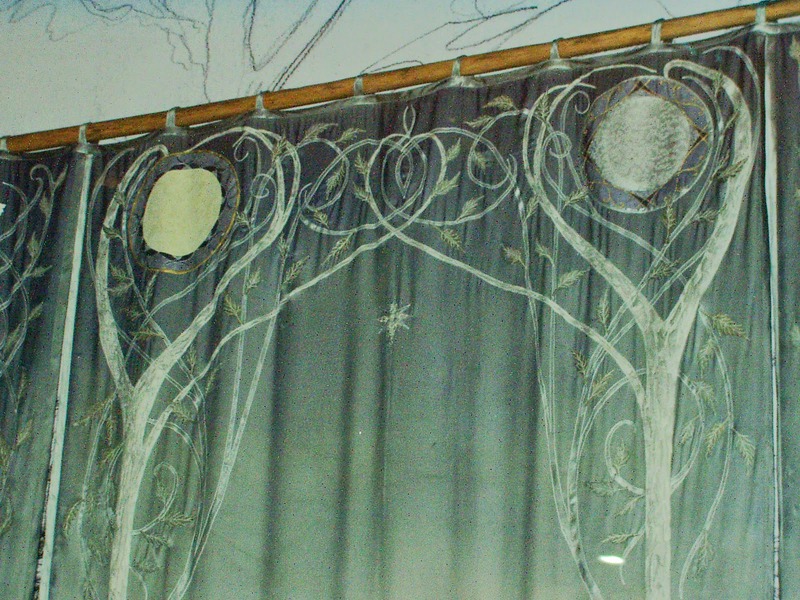 Definitely do the scrollwork with couched silver cord. Then there was this one, done with heat n bond and lame applique, and details in a silver paint pen. I lover her speckled stars look, it just looks So. Incredibly. Awesome. Done with fabric applique with fusible interfacing. I remember than Joan of Arc referred to the making of her banner as hiring someone to "paint" her banner, so it must be authentic. 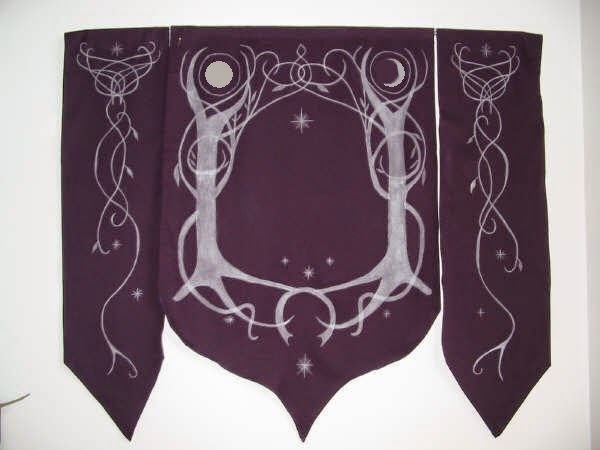 So I am planning to probably do a rendition of Arwen's banner. 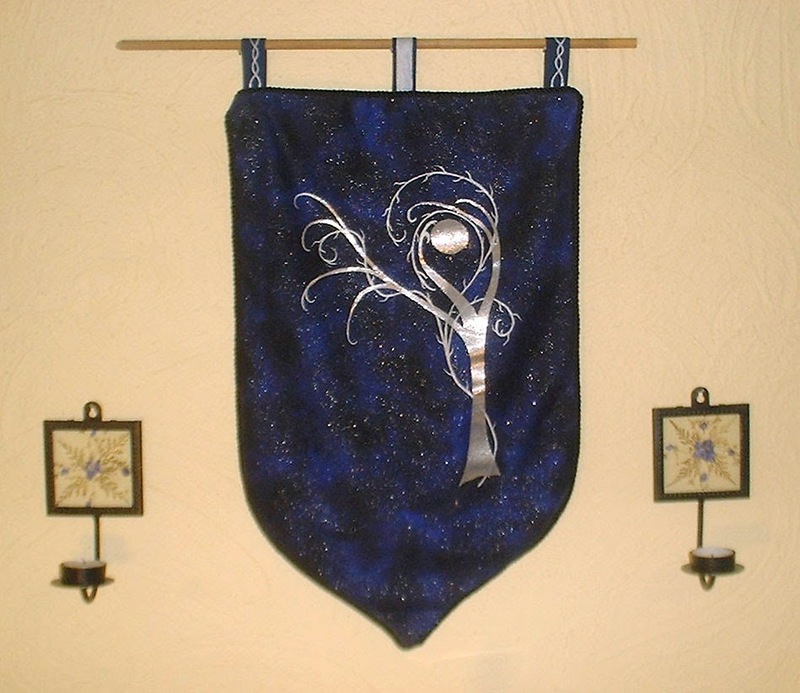 And a Gondor banner, ofcourse. 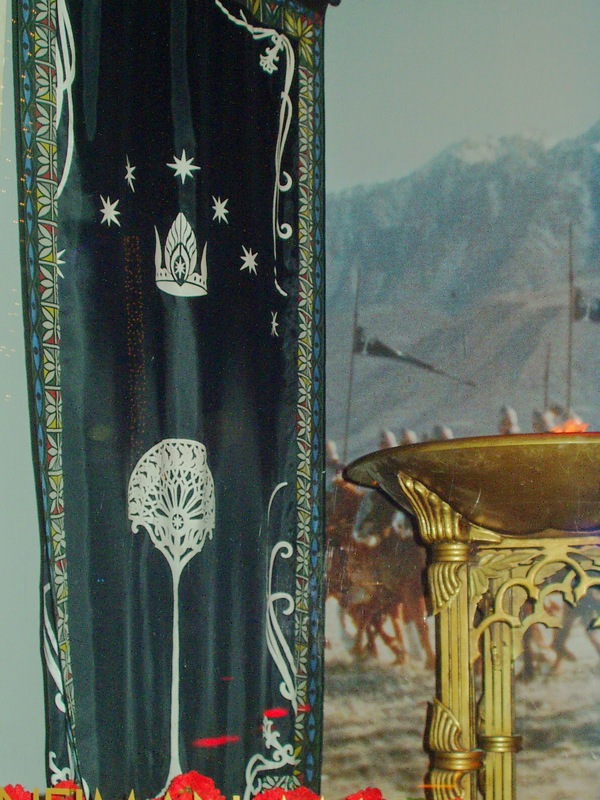 I need a Gondor banner. 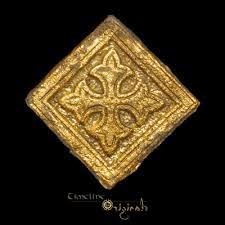 I am planning to paint some sort of elaborate medievalish looking border on it, all in silver. I think Tolkien would approve. We went to the zoo again, this time Jenny wearing another dress from a re-purposed shirt....anyways, the kids had fun. She kept pointing to new animals in the exhibit "I want to ride duh...[insert Jenny's names for things here]!" "I want to ride duh ewephunt!" Isaiah was cautious, and preferred the warthog, as he could climb on to it himself. Isaiah on the elephant. Earlier, when we were looking at real live animals, he got really excited over the emus. "Dragons!" Josh corrected him "No, they're not dragons. They're really big birds" to which Isaiah responded joyfully "Dere DINOSAURS!!!" After posing on the baby elephant, Jenny requested that Josh put her on the "big Daddy Elephant"
Isaiah was a little nervous on the (ibex??). I decided baby Keziah needed to join in the fun and ride the Lion. Josh helping them see the lions and tigers. There was much joy, as the usually-always-sleeping lions got up and did such thrilling things as lick themselves. "Duh Mommy Wion went and sees duh Daddy Wion! Duh Daddy Wion wake up! Duh Mommy Wion walking..." Isaiah and Jenny gave us a running commentary. Much fun was had by all. We came home and Jenny gave a meticulous report to Grandma and Grandpa about what we saw. "En we saw duh Turtle, en duh fish, en duh Mommy Wion woke up..." etc.